You can put them in a house, you can add a mini mouse, you probably shouldn't put them in a box or share them with a fox but, you can put them here or there. You can put them anywhere. We do love terrariums and dish gardens. We do love them, Sam I am. Ok, thanks for indulging that earworm. Back to the matter at hand—Terrariums and dish gardens are a great way to bring some small scale green into your home or office. They're also a great way to get kids interested in plants and growing things. You can create gardens in almost any kind of container. For enclosed terrariums, we recommend using a glass vessel that does not have drainage. 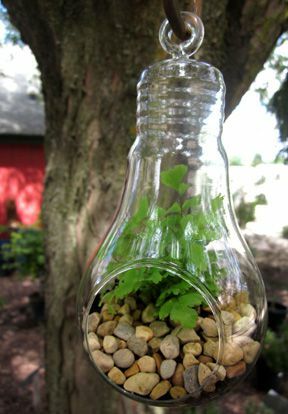 It can be anything from a standard enclosed terrarium, a lantern or even a mason jar for an extra small terrarium. Be creative! Almost any glass vessel can become a terrarium as long as it is big enough to support plants. For open containers such as dishes or pots, we recommend adding a drainage hole or picking a container with one. If it doesn’t, you will have to be very careful not to overwater it. 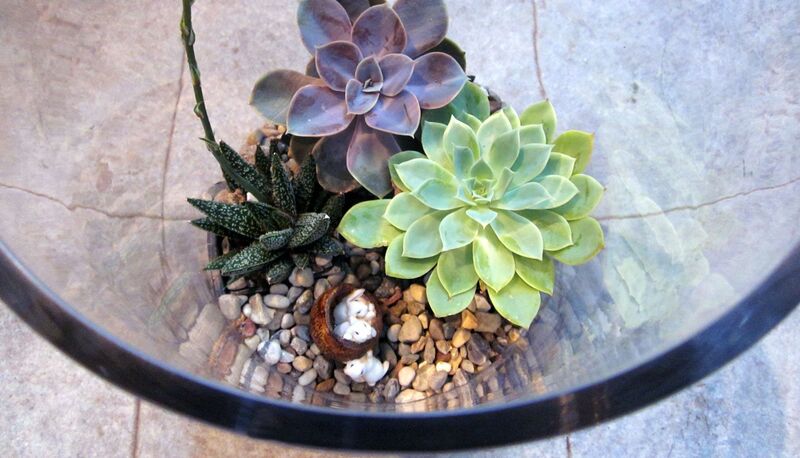 You can also turn an open container into a terrarium by adding a glass cloche. For enclosed containers, create drainage so plants do not drown. Layer the bottom of the vessel with about one inch of pebbles or gravel. Add a layer of activated charcoal to keep the soil healthy and minimize bacteria. Rinse your charcoal and pebbles before placement to remove dust and other debris. Lastly, add potting soil for your plants. We recommend using a potting soil without added fertilizer because the goal is to keep your plants small. For open containers, plain old potting soil is perfect. Make sure that the soil depth in your container matches the depth of the soil the plants are currently planted in. With terrarium and dish gardening, plants may need to be trimmed to fit in the containers. Depending on the size of the plant you may need to lightly trim roots or shake the soil off them so that they can be tucked in a small space. You may also need to prune some foliage to keep a plant small for an enclosed terrarium or cloche. Add stones, miniature accents, ceramic mushrooms, twigs, shells, fairies, gnomes, feathers, bark, and more to give your garden unique personality. Enclosed containers need far less watering than open containers. Water your plants when you first create your terrarium or dish garden. Check the container frequently to assess the soil moisture. Tropical terrariums should be consistently moist. It's also a good idea to lift the lid or the cloche once in a while to allow fresh air in. Open containers should be checked for moisture regularly. They will need to be watered more often, especially when you run your furnace or air conditioner. Depending on your plant choices, you may need to water every couple of days or perhaps once a week. Succulents prefer a dry environment, but will still need to be checked for watering every week or so. When considering plants for terrariums and dish gardens make sure you select the right plants. For the humid environment of a terrarium, ferns and miniature houseplants are appropriate as they are shade loving and can tolerate the closed containers. Ideal plants for dish gardens are small sized succulents and sun plants that thrive in the open drier semi-arid climate. Want to learn more? This Saturday, June 24, 2017 is our Gardener's Art Fest in Naperville. We'll have talks throughout the day and at 1pm, terrarium enthusiast Joannie Rocchi, will teach you the basics for success and spark your imagination with endless possibilities. (We're pretty sure she has over 20 terrariums in her house). Click here for the full Gardener's Art Fest schedule of events. So in the words of Dr. Seuss, "Try them, try them, and you may! Try them and you may, I say!"